As with the allegations by two previous accusers, the latest incidents are alleged to have occurred decades ago. In a sworn declaration, Julie Swetnick of Washington, D.C., said she witnessed Kavanaugh ‘‘consistently engage in excessive drinking and inappropriate contact of a sexual nature with women in the early 1980s.’’ Her attorney, Michael Avenatti, provided the declaration to the Senate Judiciary Committee. Ford says she was too afraid and ashamed to tell anyone about the details at the time. ‘‘This is ridiculous and from the Twilight Zone. I don’t know who this is and this never happened,’’ he said. The committee also released a two-page prepared statement from Kavanaugh for Thursday’s hearing in which he ‘‘categorically and unequivocally’’ denied Ford’s allegation. She has said he forced her into a room at a high school party, held her on a bed and tried removing her clothes as he muffled her mouth with his hands. Ford says she eventually escaped. Kavanaugh’s written testimony for the committee went a bit further than the description of his youthful behavior he gave in a Fox News Channel interview Monday, when he said ‘‘people’’ may have drunk too much at high school parties. ‘‘I drank beer with my friends, usually on weekends. Sometimes I had too many. In retrospect, I said and did things in high school that make me cringe now,’’ Kavanaugh said. The May through August pages mention several parties at various houses and also a beach week, highlighted in all caps, the week after Kavanaugh’s exams. Nothing on the calendar appears to mention Ford, who has said she was a ‘‘friendly acquaintance’’ of Kavanaugh’s at the time. Sen. Lindsey Graham, R-S.C., a Trump ally, warned Republicans not to ‘‘bail out’’ on Kavanaugh. ‘‘The longer this nomination sits out there the more you’re going to get reckless allegations that have no basis in fact,’’ he said. 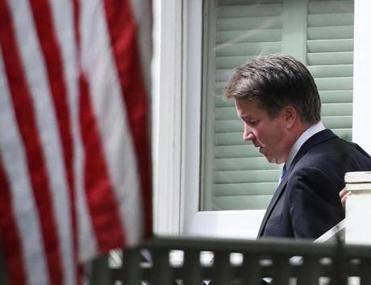 ‘‘Brett Kavanaugh,’’ Ford responded by email, according to Koegler, her son’s baseball team coach. Associated Press writers Kevin Freking, Mary Clare Jalonick, Padmananda Rama and Matthew Daly, contributed to this report.